The post was very helpful. Thanks for sharing with us. One thing that has been bothering me for awhile is...are disques comments good seo wise? Please see my comments above. You will find the answer to your question. I can't tell you how useful this site is! It certainly made me buy the software. My question is; will links back from comments like this one, on websites like yours and others, increase my SEO? Today, most of the forums and blogs use no-follow attributes.And we also do. But practice shows that even no-follow backlinks are counted by Search Engines. Of course, Google treats them not the way it deals with do-follow ones, but still they do benefit. You, know it usually takes up to 2 weeks for Google(and other Search Engines) to index the changes you made on your site and re-evaluate its position. 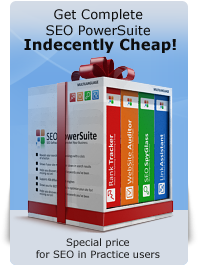 Please note, that the fact that you use SEO PowerSuite tools doesn't guarantee, that you will rank high immediately. These are just tools to help your SEO, when used properly can become a real treasure for you. congratulations for your document, I'm trying to follow him step by step and understand how to measure simultaneously the results of each action. 1) I made ​​bidirectional by unidirectional links from sites with higher rank and more in the old entrance to this new more (eliminating the reciprocal). 2) I entered TITLE and DESCRIPTION on the individual links, different from site to site. as I do, with the tools of Spyglass, rank or other to measure the impact of my change? Ps..Looking to do link exchange with others. If you've made the mistake of buying bad links, can you overcome them with quality ones? Sure,you can always combat bad links with high quality links. This is a work that you need to define by yourself.Think about tactics and strategies and you will find the answer. My comment is coming in since Google has majorly cracked down on link farms a couple months ago. My question is, we have done everything on the up-and-up to optimize our website for search engines. We've been really careful about who we link with; I don't want to incur any penalties, so it's worth it to me, even it takes some time. After some Hubspot courses, I'm finding the only thing remaining is acquiring backlinks. And how do we get reputable websites to link to us? We do have several contacts in the industry with whom wer'e linked, however, we want to keep ramping it up. Any suggestions?